A Washington state teenager has pleaded guilty in Spokane County Superior Court to first-degree murder for the August 2013 death of Delbert “Shorty” Belton, an 88-year-old World War II veteran. Kenan Adams-Kinard, 17, changed his plea as part of a deal in which prosecutors agreed to drop robbery charges against him, according to The Spokesman-Review. Prosecutors recommended a 20-year prison sentence. A judge will determine sentencing later this year. 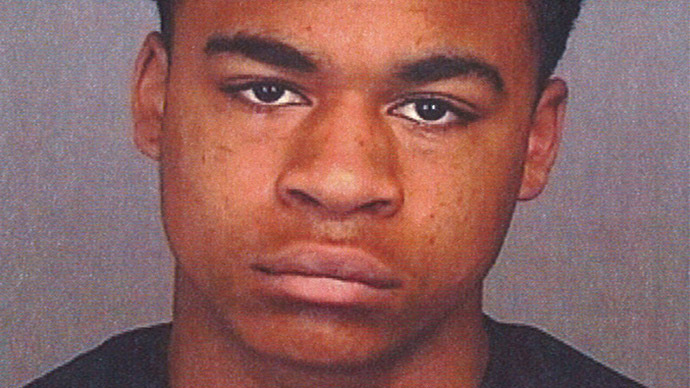 Adams-Kinard and Demetrius Glenn, both 16 at the time, approached Belton while he was inside his car outside of an Eagles Lodge in north Spokane on the night of Aug. 21, 2013. Belton died the next day of injuries sustained from the beating. Both Adams-Kinard and Glenn were arrested and charged with first-degree murder, first-degree robbery, and first-degree conspiracy to commit robbery. Both initially pleaded not guilty to the charges, according to The Spokesman-Review. Glenn, whose trial is set to begin on Jan. 12, has not changed his plea, according to the report. Glenn’s lawyer, Christian Phelps, told NBC News in August 2013 that "there are no eyewitnesses and no forensic evidence that links either of the kids to the crime." Prosecutor Larry Haskell said the recommendation of a 20-year sentence for Adams-Kinard – a lower sentence than legally allowed for the crime – was based, in part, on his “maturity and impetuosity,” and because the teenager did not use a weapon. Haskell said Adams-Kinard’s troubled home environment was also taken into account. Until he reaches the age of 21, Adams-Kinard will serve his sentence in a juvenile facility. During Wednesday’s hearing, tension between a Belton family member and Adams-Kinard supporters boiled over into a brief argument. Court staff escorted Adams-Kinard supporters from the hearing room, according to The Spokesman-Review. Barton’s family did not comment on Wednesday’s plea, saying they will make a statement at the yet-unscheduled sentencing hearing. According to a police affidavit, Adams-Kinard said he "was trying to buy an ounce of crack cocaine from 'Shorty' and 'Shorty' tried ripping him off,” causing him to punch Belton and take his money back. Yet a police spokesman told NBC News last year that there was "no evidence to support" the accusation that Belton attempted to deal drugs. Adams-Kinard and Glenn were on the run for four days, during which Adams-Kinard told friends the incident was a result of a drug deal gone bad. "I took his wallet and another ounce of crack from his pockets. He was unconscious, so I made sure he was still breathing, and then I took off," the affidavit quoted the letter as saying. Yet Phelps, Glenn’s lawyer, told NBC in August 2013 that he was wary of the claim.